"I developed a DVT following my motorcycle accident where I broke my leg. It happened about 10 years ago. I remember an aunt of mine also sufferred a DVT after her flight from Europe. My leg has always been a bit swollen, and recently I noticed a dark patch at my ankle and a small wound that just doesn't want to heal. " Deep vein thrombosis of the leg simply means a bloot clot within the main / deep veins of the leg. This blood clot can occur in the lower leg, thigh or both at the same time. A DVT if left untreated will grow to extend into other veins. DVT's can occur spontaneously or after provoking events, such as trauma, surgery or illness. Complications of DVT include potentially life-threatening pulmonary embolism - where part of the clot breaks-off and pass to the heart and lungs and the longterm complication of post-thrombotic syndrome with leg pain and ulcers. A DVT often develops in the calf veins and grows towards the thigh. When a DVT does not grow, your body is able to break it down and dissolve it back into the blood. Calf and thigh veins are most at risk for the development of DVT. 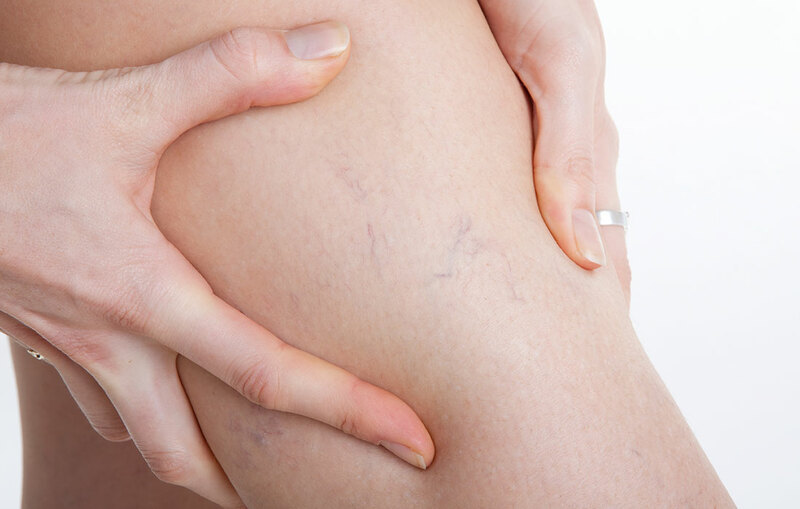 The most commonly affected veins are the popliteal and femoral veins in the leg. 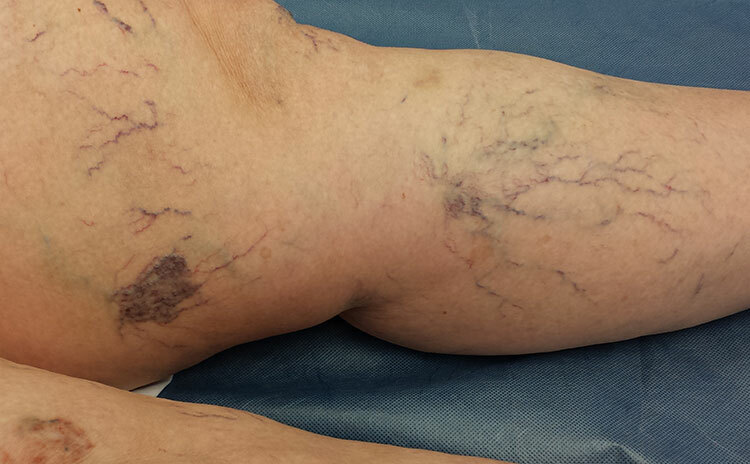 Sometimes a DVT can grow to extend all the way into the veins of the abdomen. Prevention is the single most important measure in the management of deep vein thrombosis. DVT's can present with calf or thigh tenderness, swelling of the limb, warmth to the skin, redness, distention of surface veins. Up to 50% of patients with DVT's do not have any symptoms. 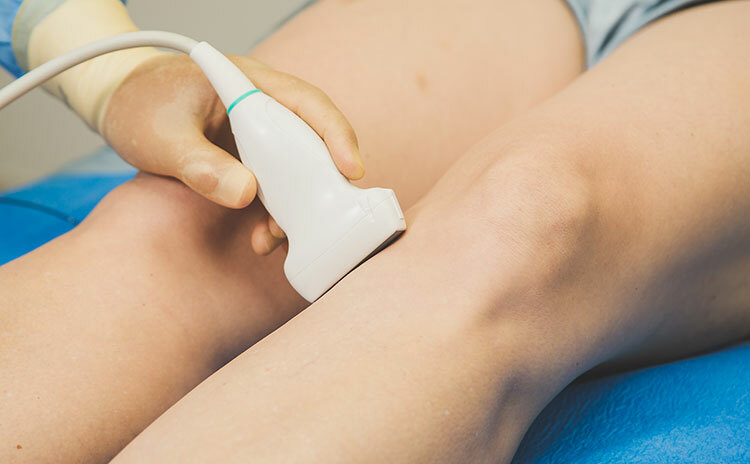 Other conditions occuring in the leg can have similar symptoms, and DVT can only be ruled out by consulting a physician and undergoing venous duplex scan. It is important to find out why a patient developed a DVT. In many cases there is an obvious cause – such as recent surgery, dehydration or a long haul flight whilst on the oral contraceptive pill. Many patients with DVT however has no known cause for their DVT, these are unprovoked DVT's. Such patients need to be medically investigated for other illnesses such as an undiagnosed cancer. Risk factors for the development of DVT include - advanced age, Major surgery - specifically orthopedic surgery, cancer and chemotherapy, inactivity or immobility, pregnancy, trauma or leg injury, Oral contraception and HRT, obesity, HIV and infection. Patients with DVT can further be complicated by passing a blood clot to the lung(pulmonary embolism) or developing chronic complications in the leg. Up to 50% of patients who develop deep vein thrombosis (DVT) will go on to develop post-thrombotic syndrome (PTS). PTS is an umbrella term for all the problems that arise in the leg where the DVT previously was. PTS is a condition that is associated with a substantial loss in quality of life . Patients with PTS are generally managed using compression stockings and leg elevation, although surgical intervention may be appropriate in select cases. Chronic thromboembolic pulmonary hypertension (CTPH) occurs as a complication in 3–4% of patients who survive pulmonary embolism (PE). Patients with CTPH may be managed surgically via pulmonary endarterectomy or, if this is inappropriate, lung transplantation. Prompt diagnosis and treatment of deep vein thrombosis (DVT) is essential to decrease both the risk of recurrence and further complications. Treatment consists of anti-coagulating the blood or thinning your blood by taking medications such as anti-coagulants. The use of compression stockings is an important adjunct to pharmacological treatment in patients with DVT. Other venous thromboembolism (VTE) treatment approaches may include: surgery; catheter-guided thrombectomy; or thrombolytic therapy. Walking and calf exercises is an important measure to prevent DVT. Some patients might require long term anti-coagulation to prevent recurrance of DVT. If you have multiple blood relatives with past DVT or PE, you should be medically investigated for a clotting disorder. Sit in an aisle seat on long haul flights and drink plenty of water. Venous duplex ultrasound scanning is the current gold standard in the diagnosis of DVT. It involves the use of an ultrasound machine and high frequency probe to accurately asses the anatomy of your veins as well as the flow patterns wihin them. Ultrasound scanners do not produce any radiation (unlike x-rays) and they don’t involve needles or injections.